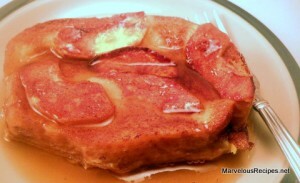 A delicious French toast recipe that’s great for breakfast, brunch or even as dessert! And just in time for apple harvest! 1. Preheat oven to 400 degrees F. With a serrated knife, slice the French bread into 1-1/2-inch slices. Place in a single layer in a lightly greased 11×7-inch baking dish. 2. In a large mixing bowl, whisk the eggs until well blended. Add the milk, 2 tablespoons sugar and vanilla extract; whisk until well blended. Pour 1/2 of the milk mixture over the bread slices. 3. Arrange apple slices evenly over the bread; pour remaining egg mixture over the apples. In a small bowl, combine the remaining 1/4 cup sugar and the cinnamon; sprinkle over the top. Dot with the butter or margarine. 4. Bake for 30 to 35 minutes or until the apples are tender. Allow to stand for 10 minutes before serving. Serve with maple syrup. Makes 6 servings. These sound delicious! I’ll try them soon. This sounds so good!! I love apples!! I’ll have to give this recipe a try! !